South Korea-Based Air Defense Battery Integrates Counter-UAS into Core Competencies » UAV DACH e.V. In January 2019, E/6-52 received orders to provide C-UAS protection in the garrison environment on Camp Carroll, South Korea, which included the integration of new systems into normal Short Range Air Defense (SHORAD) operations. Ultimately E/6-52, under the 2-1 ADA “Guardian” Battalion, set a new precedence that significantly changes the capabilities that a single Avenger Platoon can bring to the table. This is the concept that an Avenger Team can not only dismount with a shoulder-fired Stinger Missile (or MANPADS), but they are also equipped with a highly portable Drone Defender system for UAS engagements. This further layers our defense of assets and increases the ability to protect all aspects of the battlefield. Leaders within Echo Battery used the Military Decision Making Process format to create a base defense design that adhered to ADA employment principles of mix, mutual support, mobility, mass and integration. The defense design consists of organic SHORAD capabilities and C-UAS systems, using the “mix” employment principle, which is “the employment of a combination of weapons systems to protect the force from the air threat”. Avengers were emplaced with primary target lines (PTL) facing the most likely air avenues of approach for hostile UAS as an additional layer of protection. The Avengers were emplaced to provide mutual support by positioning the weapon systems so that the fires of one weapon system could engage targets within the dead zone of the adjacent weapon system. Additionally, the Avenger crews were equipped with a Drone Defender, a man-portable C-UAS system that has a planning range of 500 meters and encompasses the “mobility” employment principle. The Drone Defender allows the crewmembers to non-kinetically engage UAS from any direction up to 500m. One crew member manned the turret of the Avenger at all times and used the FLIR and air picture from the Sentinel Radar to search and scan for incoming aircraft or UAS. The official mission of the Air Defense Artillery (ADA) branch is “to protect the force and selected geopolitical assets from aerial attack, missile attack, and surveillance” (FM 44-100). The U.S. Military invested heavily in Air Defense and developed weapon systems that could eliminate any threat to their force or geopolitical assets since its inception. Air threats can present themselves at vastly different altitudes, so ADA split itself into two main domes of responsibility: High to Medium Range Air Defense (HIMAD) and Short Range Air Defense (SHORAD). UAS are categorized into five Groups according to their size and capabilities. Group I and II UAS are low, slow and small UAS that are incredibly inexpensive in comparison to Group III and above, which are typically described as “military grade” UAS. Group III-V UAS are typically only used by near-peer and peer adversaries and are operated at higher altitudes, longer ranges, and are hard to detect. UAS which fall into Groups I-II and are exceptionally easy to purchase and use. The accessibility of these products has extraordinarily increased their overall use. Not all UAS operators have hostile intent – many are just drone enthusiasts. However, foreign adversaries and insider threats can utilize COTS UAS to cause significant damage to military operations and critical assets. Distinguishing between a hobbyist and a real threat has generated a problem for the U.S. Military and the third pillar of the Air Defense Mission, “surveillance.” The utilization of UAS by adversaries has been nicknamed the “Poor man’s air force” and provides a number of advantages for those who use UAS in the operational environment. First, it provides an economic advantage. The loss of a $250 Group I UAS would not be as catastrophic compared to the loss of a multimillion-dollar aircraft and its pilot with thousands of hours invested in the pilot’s training. Additionally, in order to defeat a UAS, the benefit has to exceed the cost. The Patriot weapon system can easily destroy a UAS with different types of interceptors. However, these interceptors range in cost from $2-6 million, while a UAS can cost as little as $100. In a battle of cost attrition, the U.S. would lose in this scenario. In the past, the demand for proficient C-UAS operators has been exclusive to the tactical environment – an environment with clearly defined rules of engagement. The threat now pervades both tactical and garrison environments. 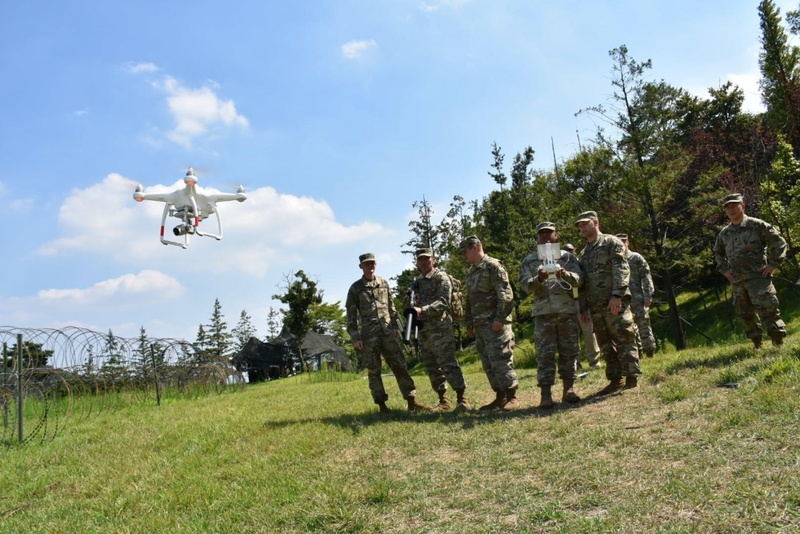 Most military bases in the KTO are surrounded by highly populated civilian areas with growing numbers of drone enthusiasts, making it difficult to distinguish between civilian hobbyists and possible enemy incursions. It is almost impossible to know who is operating a UAS and what their intentions are. E/6-52 has been at the forefront of protecting friendly forces in the KTO from UAS threats since November 2017. 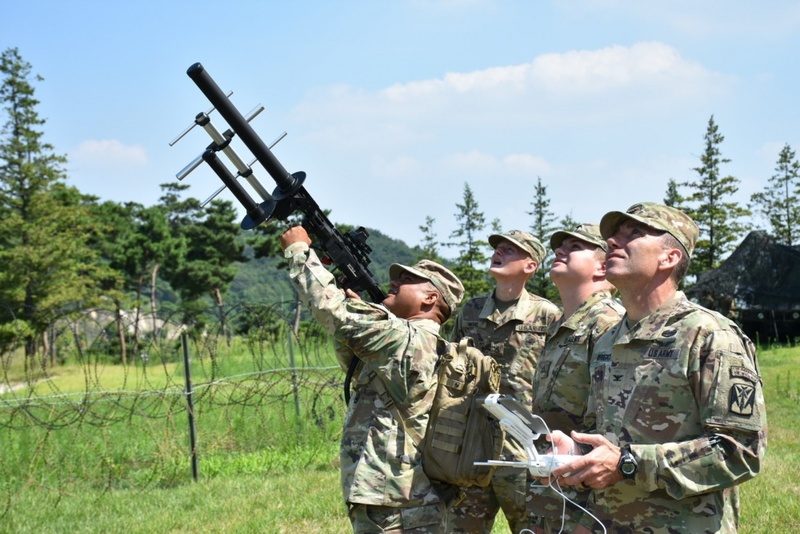 The 35th Air Defense Artillery Brigade has developed a flyaway package to defend military bases and assets against aerial threats; especially the emerging and advancing UAS capability. The purpose of the flyaway package is to provide C-UAS protection to friendly forces across the KTO at a moment’s notice. UAV DACH: Beitrag im Original auf https://www.uasvision.com/2019/03/21/south-korea-based-air-defense-battery-integrates-counter-uas-into-core-competencies/, mit freundlicher Genehmigung von UAS Vision automatisch importiert. Der Beitrag gibt nicht unbedingt die Meinung oder Position des UAV DACH e.V. wieder. Das Original ist in englischer Sprache.